Margaret performs both alone and with musician Richard Scholtz. 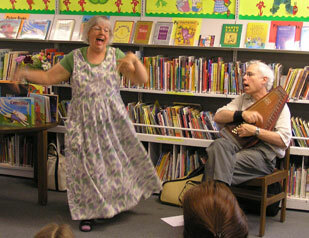 Visit MacDonald & Scholtz Singing Tales. 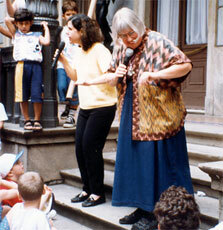 Her performances always involve her audiences in lively interaction through song, chant, and movement. MRM delights in discovering and sharing joyful folktales from the world's many cultures. 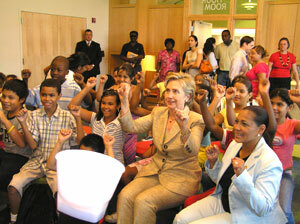 She encourages her audiences to carry the stories back into their communities and keep sharing them. MacDonald's tellings are a delight for both young and old. "I hope I can convey to you how joyful it was to have you here telling stories." 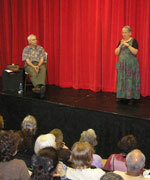 ...Beth Eisenhood, Washington Talking Book and Braille Library. "MacDonald's storytelling in English, coupled with Soejadi's expert rendition in Bahasa Indonesia created an experience that was beyond the limitations of language." The Jakarta Post, July 29, 2003. "Margaret and Richard were wonderful! They both made it seem so easy. Audience members commented afterwards that they loved seeing Margaret tell in her stocking feet, and on the way she seemed to float and bob around on the stage. Her gestures, especially when creatures were revealed to be handsome heroes, were priceless. She was presenting us all with a wonderful gift and was well aware of how happy it was going to make us! Richard seamlessly supported Margaret with his music. The musicians among us remarked on Richard's improvisational skills. His verbal responses often provided a hilarious deadpan counterpoint to Margaret's expressiveness. King County Library System StoryFest International, Bellevue, Washington. "Two Goats on a Bridge"...Hillary was a great audience!